Cataracts are a very common eye condition, which affects most people at some point in their lives. A cataract is when the natural lens inside the eye gradually gets misty with age. Cataracts are usually progressive and naturally get worse over time. Eyesight will get worse over time as the cataract progresses. Even though age is the most accepted risk factor for cataracts some children are unfortunate enough to be born with cataracts and these are term congenital cataracts. Some people also develop cataracts more quickly because of an injury or medical conditions such as diabetes or certain medications such as steroid use. Initially you may notice subtle changes in your vision if any such as difficulty with reading or reading captions on television. You may also experience more glare on bright days or when you are driving at night. 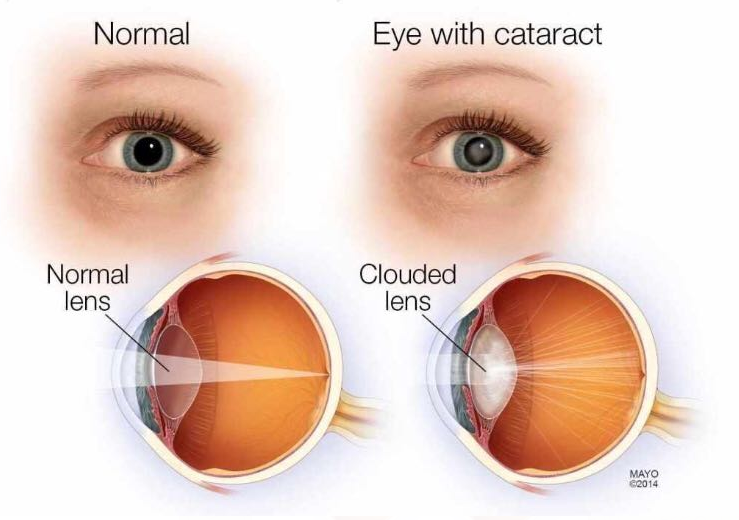 It is not uncommon to be told you have “early cataracts or lens opacities” for many years before you notice any effect from them. It is not entirely clear why we are more likely to develop cataracts as we get older but some factors may increase your risk of cataracts. These include: a family history of cataracts, smoking, diabetes, eye injury, long term steroid use and drinking too much alcohol. Surgery is the only way to treat cataracts. Cataract surgery involves replacing the cloudy lens inside your eye with an artificial clear lens. Cataract surgery is the most common operation performed in the UK with a very high success rate in improving eyesight. It can take 4-6 weeks to fully recover from cataract surgery. The procedure is fairly straight forward and usually takes about 30 minutes. It is often carried out as day surgery under local anaesthetic and you should be able to go home on the same day. After cataract surgery you should be able to see things in focus again, minimal glare and have better colour vision. The risk of serious complications developing as a result of cataract surgery is very low. There is a small risk of about 1 in 1000 of permanent sight loss in the treated eye as a direct result of the operation. When your cataract starts to develop, you may feel your sight is changing or not as good as it once was. Some people describe it as looking through dirty spectacles lenses. You may also notice that colours appear less bright. You may suffer from glare especially at night. Cataracts are mainly age related however cataracts can also affect babies and young children.